When a movie prop supplier goes out of business, it's bad news for them, but good news for us retrophiles. 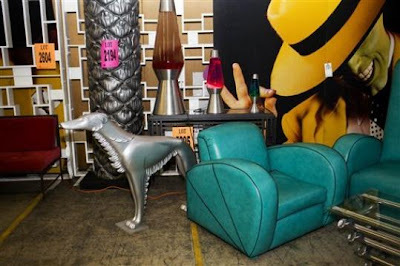 20th Century Props, which provided props and furniture for both the big and small screen for several decades, is closing up shop and auctioning off thousands of items from its warehouse. There are the usual freaky monster stuff for eccentric collectors, but most of what I could see on an ABC Evening news report last night showed all sorts of cool vintage items, from dozens of art deco style lamps to 50s style chrome clocks and telephone booths. A wide assortment of 60s and 70s furniture is also available. The items come from just about every TV show or movie you can name off the top of your head, from "The Twilight Zone" to "Austin Powers." searching forRetro Furniture Store at reasonable prices, then log on to Spacify.com.